SearchReSearch: Update: More about the Farallons -- "What IS that below?" Update: More about the Farallons -- "What IS that below?" We answered that yes, you could see them, but your eyes would have to be 489 feet in the air. It turns out that this is the height you'd need to be to see the islands at sea level. In other words, if you wanted to look at the waves crashing on the shores of the Farallons, you'd need to be 489 feet up. That was what we calculated, and it's still correct. It just so happened that I went to San Francisco a week ago, and I went to check this out. The Farallons are mountainous islands; they stick up out of the water by quite a bit! Our calculations didn't take that into account! In particular, Southeast Farallon Island (SEFI) is the largest island, with an area of 95.79 acres or (0.14970 square miles or 0.3877 square km). The island is pyramidal in shape and 357 feet (109 m) high. 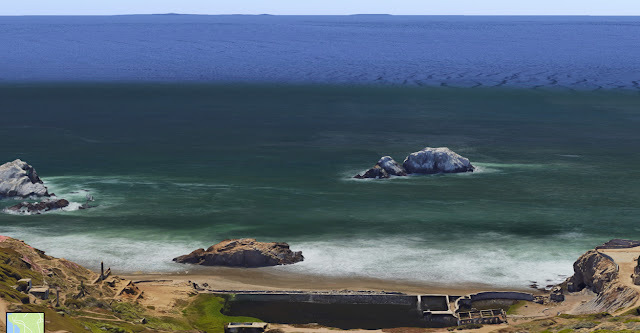 In the middle, Seal Rock (Saddle Rock), is around 80 feet (24 m) high, while Aulone Island and smaller Great Arch Rock (Arch Rock) are immediately north of the northern tip of SEFI, and are 350 feet (110 m) in height. 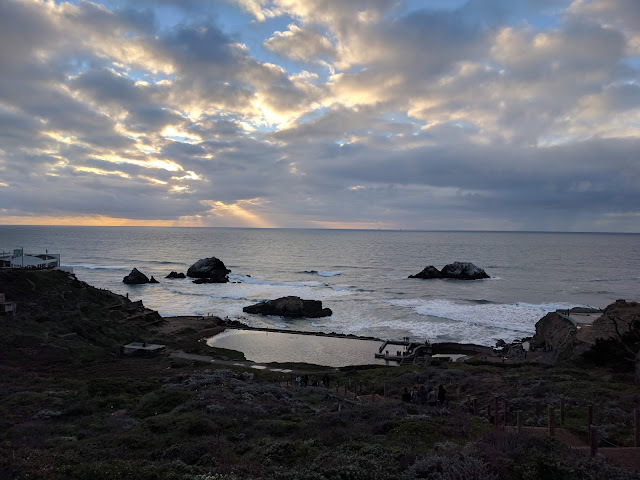 From my car in the parking lot at Sutro Baths, around 250 feet (76 meters) high, I took the following photo. I was happily surprised to see the Farallons on the horizon. Fantastic! 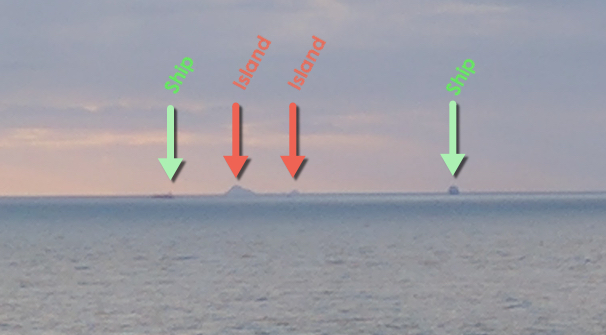 As you can see, SEFI is clearly visible, as are Aulone Island and the Great Arch Rock (which blur together in this image). You can barely see a ripple of the islands between them. Here's the satellite image from Google Maps. 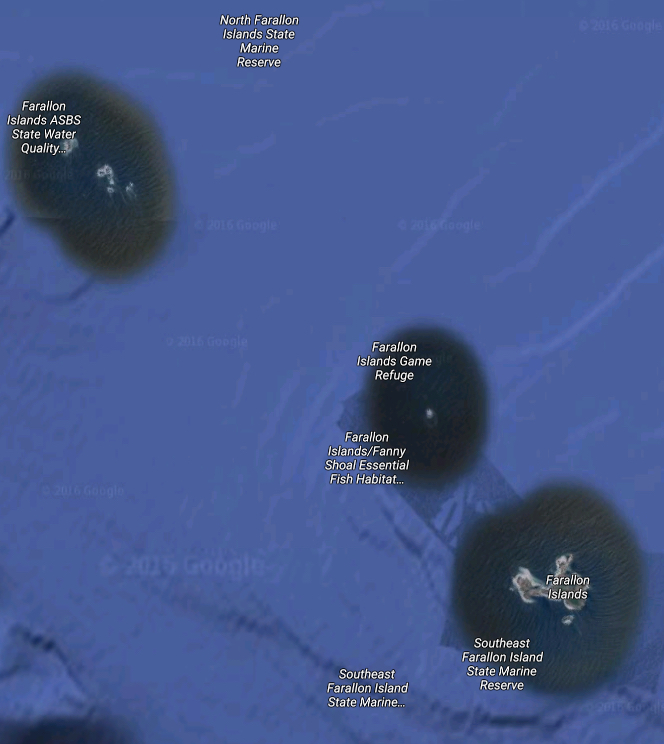 The Farallons, seen in satellite view on Google Maps. And here's the 3D view on Google Maps, as seen from the parking lot (very near where I was standing). I have to admit being a bit surprised. Yes, they're clearly visible, but I didn't think they would be visible from the parking lot--it's only 250 feet up. But I'd forgotten that the calculation we made was to the island at sea level, and not to the top (or middle) of the island. B. You find out more about what the question REALLY is all about, and not just what you might think it is. I learned something really useful here. When you're making basic geometrical calculations, it's handy to really look at your diagram to see if it represents what you think it does. When I took the photo, I was only at 250 feet high... but the islands stand another 375 feet high out of the water! As your grade school math teacher probably told you: "Check your work!" Happy to find an error (and correct it)! Actually, there's more to this. Your analysis neglects atmospheric effects. You're absolutely right. But as that article points out, "A simple approximation is to consider that a mountain's apparent altitude at your eye (in degrees) will exceed its true altitude by its distance in kilometers divided by 1500." (Assuming normal temperature and pressure.) Since the islands are 43 km away, the apparent height will be 43/1500 = 0.028, or about 28 meters, which I feel okay about ignoring. Typo in my previous comment: that's 0.028 DEGREES, not meters. Which makes the apparent height really small. btw, nice picture - did you use a special camera and/or lens to capture the far away objects? was that really your camera-phone? is it a Pixel? toward sunset? you think the low light helped "pop" the Farallones? "Kyōsai is considered by many to be the greatest successor of Hokusai (of whom, however, he was not a pupil)"
B. You find out more about what the question REALLY is all about, and not just what you might think it is." - This is the difference between Sherlock Holmes & Mycroft (his brother). This is the difference between Sherlock Holmes & Mycroft (his brother). Actually, I have seen the Farallons standing on the beach. 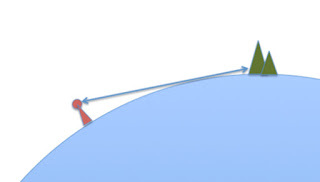 At 357 feet tall and 26 miles away and an eye height of 5 feet you get 360 fee of curvature. It's not possible even though you can see it. Earth is either flat or, they are lying to us about the curvature math. It's eight inches per a mile squared. Do the math. You'll see I'm correct. Many people can see the Farallons from Ocean beach on a sunny day. Even if you're standing 10 feet above sea level, that's about 30 feet of island you should be able to see, but we see much more than that. Try to prove me wrong. You won't be able to.